QVolume, the latest algorithm from QSound Labs, is designed to accurately and subtly manage variations in audio levels in real time when integrated with TVs, A/V receivers, PCs, and today’s handheld devices. QVolume removes the need to constantly be adjusting the volume controls when drastic volume changes affect viewing pleasure. The most obvious example of the need for such a technology, is the annoying difference in volume levels between TV programs and the commercials or when users switch TV channels. End users are constantly reaching for the remote control in order to change the volume. QVolume solves this problem by managing abrupt changes in volume in a seamless and transparent fashion all without noticeably hampering the dynamic range of the original content or introducing artifacts. Unlike other MIPS-intensive algorithms, QVolume efficiently analyzes the psychoacoustic loudness of all audio channels on a frequency-dependent basis to achieve the optimal volume for a given situation in real-time. The goal behind QVolume is to be completely transparent for the end user by not causing any noticeable pumping or disruptions to the dynamic range of the original content. Particular emphasis has been given to emphasizing the dialog content so that viewers do not have to strain their ears when listening to small speakers, commonly found in the growing portable device market. QVolume works as well in a multi-channel environment as it does in a single or two-channel setup. 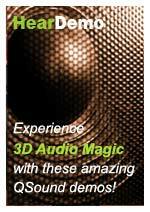 Also, since it is a part of QSound’s family of CE technologies, it works seamlessly with QSurround and QHD to provide the most natural sounding listening experience possible (all for a fraction of the resources generally required). Additionally, QSound Labs is able to offer a low volume compensation feature in those situations where communication with the external volume control is available. It is well understood that as volume decreases, bass and treble appear to disappear. 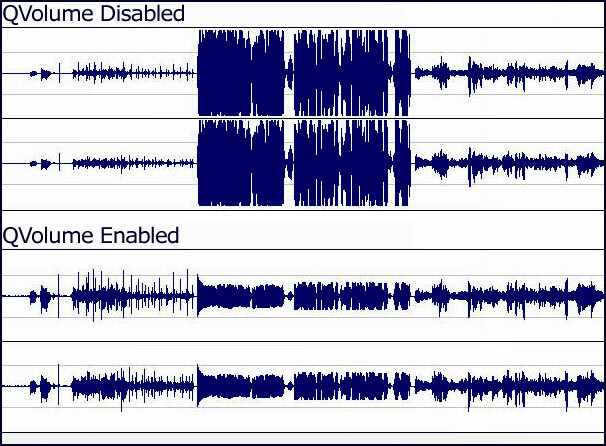 Typically, music and movie content is mixed by recording engineers at sound levels much louder than typical home listening levels. Bass and treble sounds that are obvious in the recording studio, are not as well perceived at lower volume levels. Audio solutions by QSound Labs have been rigorously optimized with the participation of our major industry partners focusing on three critical requirements: Quality, Memory Footprint, and Performance. QSound’s comprehensive suite of new voice enhancement technologies are optimised to run on the ARM 7/9/11/Cortex+Neon processors. For detailed technical information, please contact a QSound representative or email us at info@qsound.com.